Welcome! 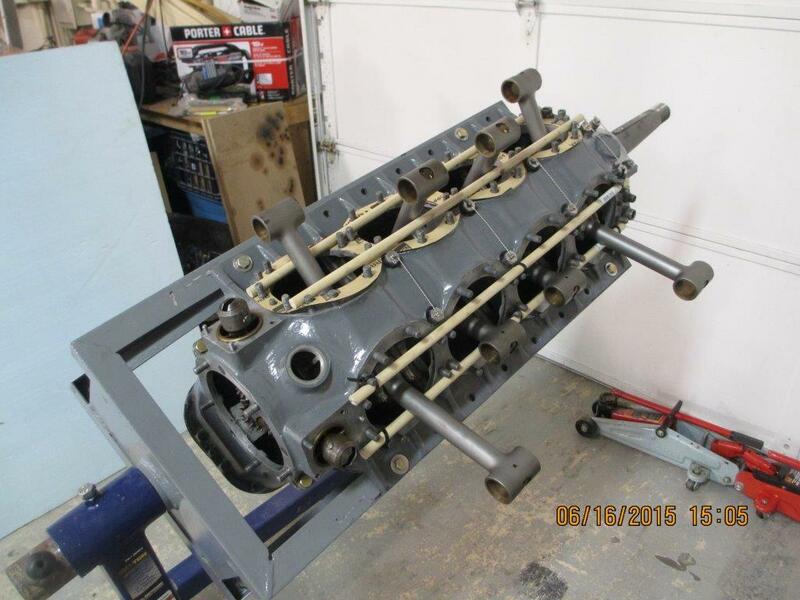 We hope you enjoy following the restoration process of a 1918 Curtiss JN4D Jenny. 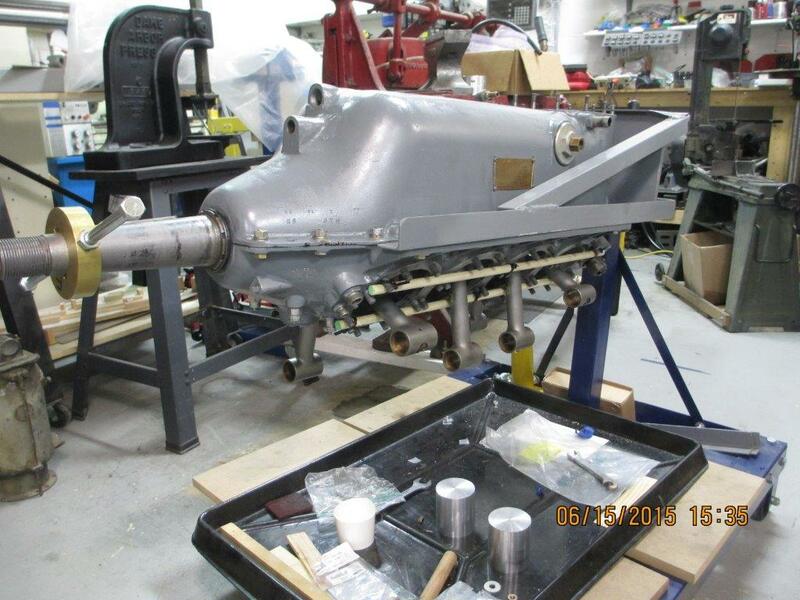 Once completed, the aeroplane will be flown and displayed at the Candler Field Museum in Williamson GA (30 miles south of Atlanta). You can contact me below by clicking on "VIEW MY PROFILE"
Back in the air !!! We had a great turn out for our museum's annual Vintage Day event. It was too windy to fly - 15 knot direct crosswind - and I mean direct - do we just kept the Jenny displayed in front of the Youth Program hangar. In the morning, I was interviewed by a local radio station broadcasting from the event. Our Jenny had good company. Chris Hill had his Fokker DR1 on display. As you can see, a set of good wing walkers were required just to taxi from one end of the field to another. The Fokker is going to be displayed at the museum next to the Jenny for a few months. We were supposed to recreate the Curtiss Candy Company's famous 1923 drop of their new product - the Baby Ruth candy bar. But the winds prevented us from using the Jenny, so I had to borrow Glen Marsh's Cub. John Gaertner was my bombardier. Many of you have asked me "what's next?" The Aerodrome saw our Nieuport 11 head off this morning for its rebuild. After suffering an unplanned and abrupt return to the earth several years ago, she has remained in storage since then. An agreement made over the course of this winter will see her returned to airworthy status at the talented hands of Brian Karli and Ron Alexander of the Candler Field Museum in Williamson, GA. Candler Field will retain the use of her, on loan, in their museum and on their flightline for a period of three years before returning to the skies over Rhinebeck and a reinsertion into the weekly airshows following that period. Brian and Ron most recently completed a museum quality restoration of an airworthy Hisso Jenny much like ORA's and it is a stunner! We are very happy to be continuing and further building this positive relationship with our fellow museum in Georgia and look forward to seeing Victor Chapman's Nieuport 11 back in the air soon! Stay tuned! Rest assured, the Jenny is alive and well. It was a beautiful evening the other day. Max Maiden took this short video. Enjoy. These old engines fascinate me. We got the Jenny back in the air with the overhauled engine, but I could not get the Hisso to idle correctly. It was too fast. I had the throttle back against the stop and the engine chugged away at 800 RPM. The engine was was smooth...and happy...but without brakes and a tail skid, we could not stop the airplane on the ground. The idle was just too high. But, the arm of the carburetor was back as far as it would go. Something was not right. It was time to dig into the Hisso manual. 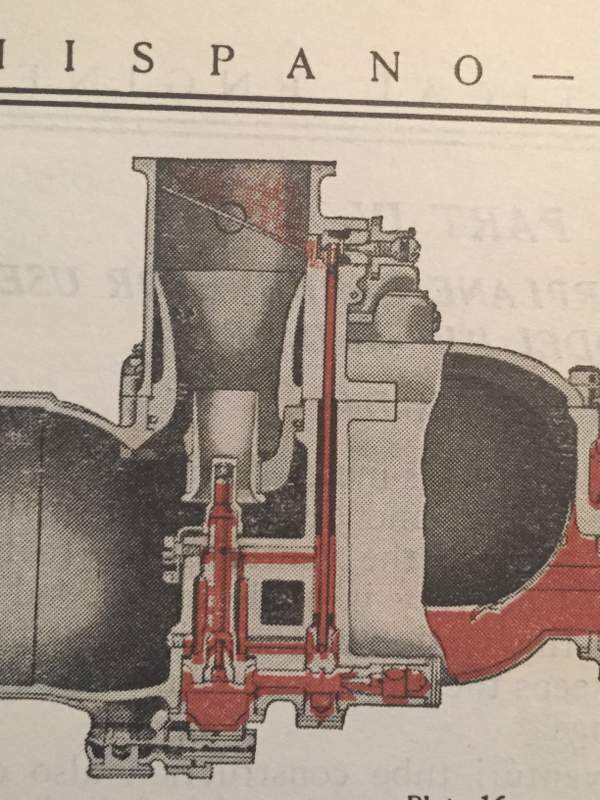 The manual showed a neat diagram following the path of the fuel at idle (red color). The Stromburg NAD-4 carburetor is a unique creature. 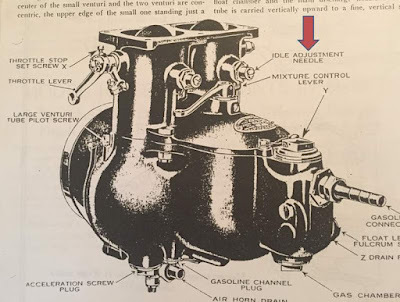 At idle, fuel is drawn up an internal tube to a small idle port in each venturi (there are two). There are two bleed screws there. Unlike modern carburetors which adjust the amount of fuel, the NAD-4 adjusts the amount of air. The book identifies these screws as "idle adjustment needles". Even better! With the engine running, we tried rotating the bleed screws. The idle speed stayed at 800 rpm, but smoke poured out the stacks as the mixture enriched excessively. Turn the screws the other way. Too lean. Engine ran rough. So much for that idea. Air comes in around the bleed screws. Perhaps it's not getting enough air. As you can see, there needs to be a gap in the threaded bleed assembly. Small holes allow air to enter and the screw meters it even more. 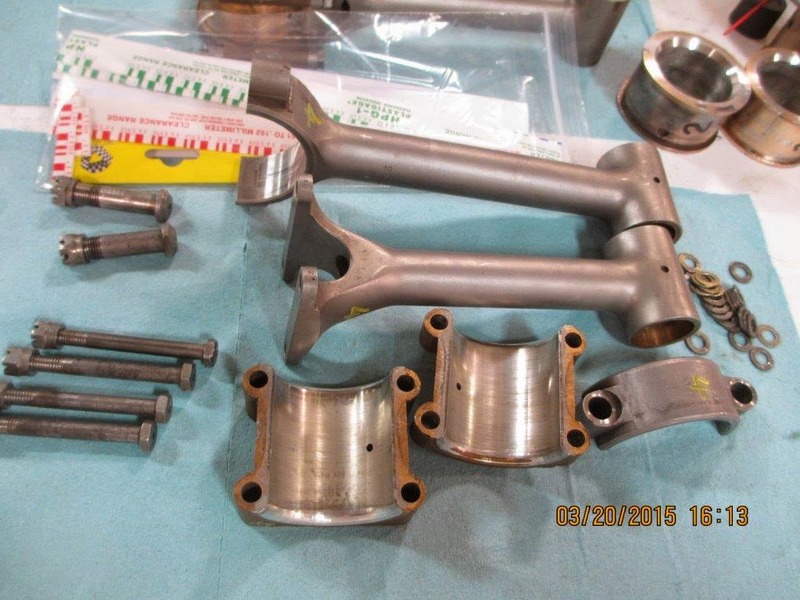 We adjusted the assemblies until the holes were fully exposed. No change. There was much head scratching and frustration. How could we fly this thing if we can't get the idle low enough for the plane to stop on the ground. I know what you are thinking. No...I'm not installing brakes. No way. I jumped on the internet and tried searching every conceivable combination of "Stromberg NAD-4 carburetor idle problems" but there was little information available. Again, I checked the physical stop on the throttle arm. 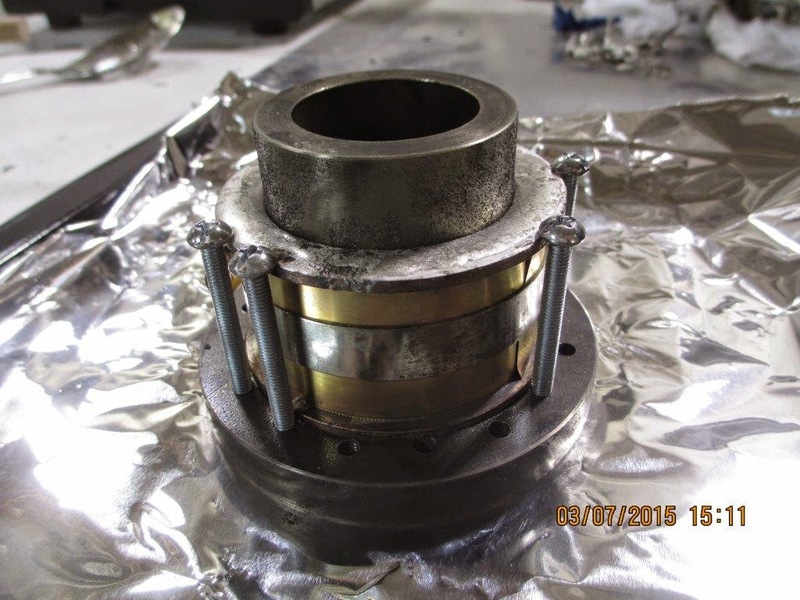 Indeed, the butterfly valve was closing. Whatever we were hitting, it was a physical stop. Another good thing about old airplanes is the plethora of help out there if you just ask. I sent emails to Frank Shelling, who has way more experience with these engines than I do, Glen Peck, Paul Dougherty, Kevin Connor, John Saunders and David Cretchley in New Zealand, Andrew King......I fell fortunate to have many friends. I was looking for a smoking gun, but the advice they gave me was clear - pull the carburetor and look around. 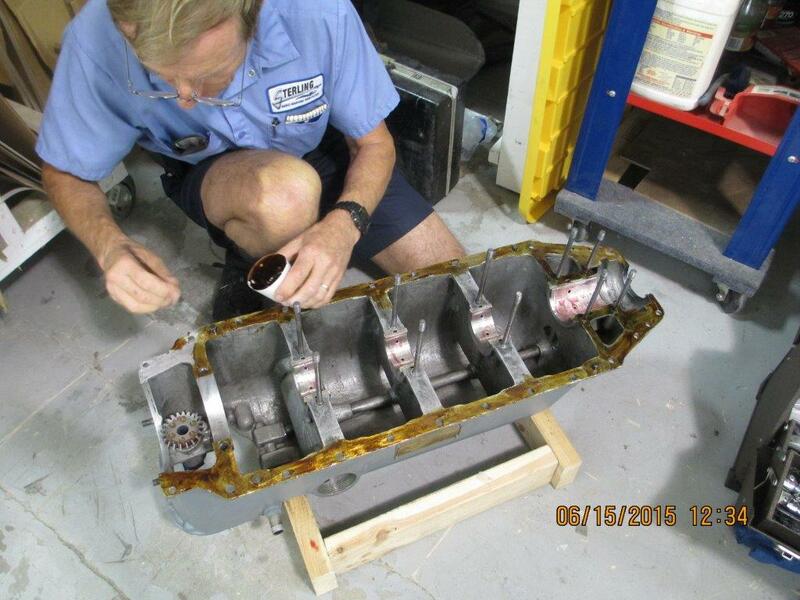 We pulled the carburetor. 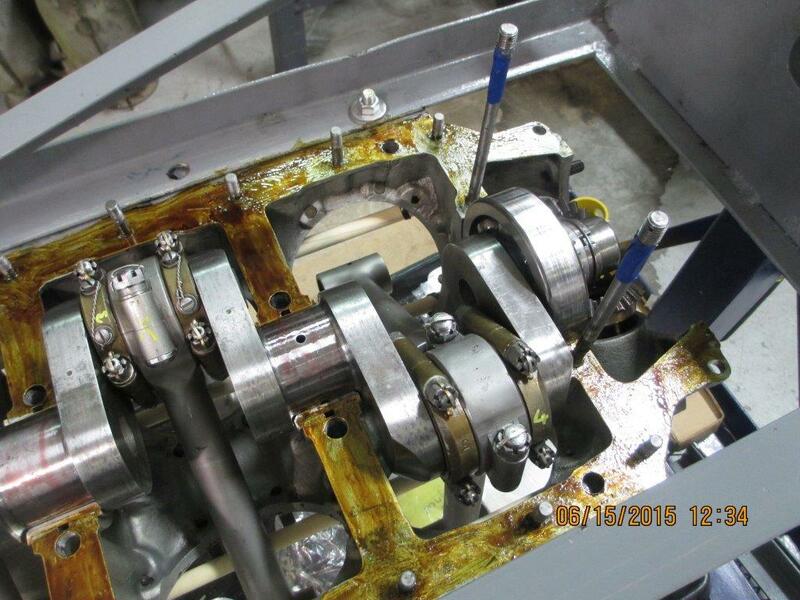 The butterfly valves moved smoothly and hit the stop. 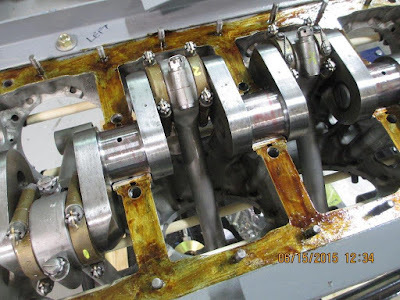 We pulled the fuel screen and checked the spring that operates the float arm. It was fine. Then we noticed something unusual. 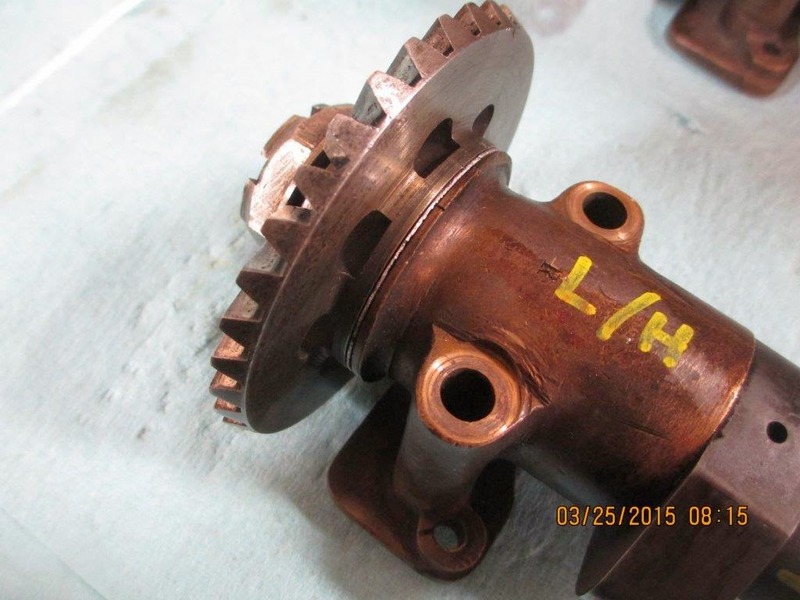 The bleed assembly was flush in the right side of the carburetor venturi. But the assembly on the left side was protruding. Here was the problem! The butterfly valve was hitting the protruding bleed assembly and it wouldn't close all the way. 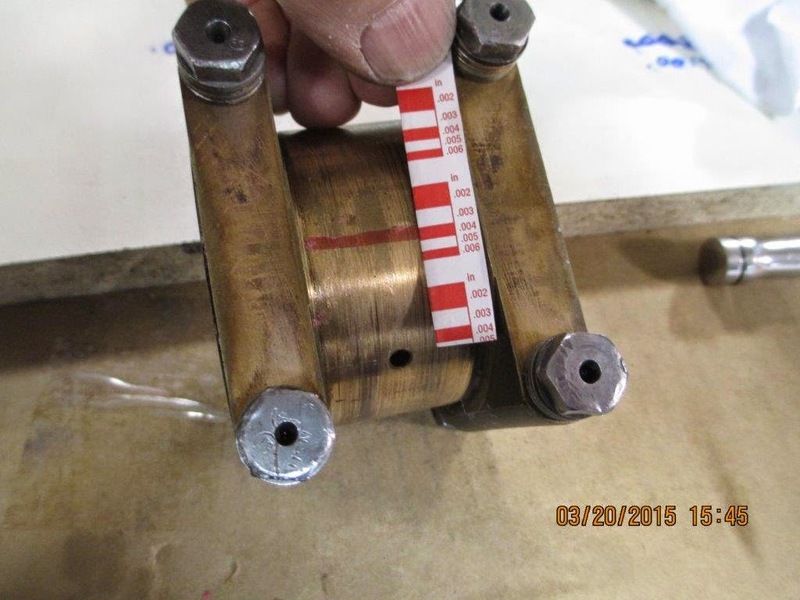 There was a gap between the valve and the venturi wall. 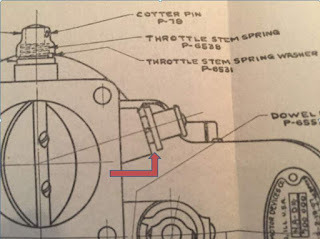 So the throttle was never fully closed...even when it was "closed". Very gently, we pushed the bleed assembly back flush with the venturi and reassembled the carburetor. I am happy to say the engine idles perfectly at 400 RPM now! I'm posting this because someday, someone will search "Stromberg NAD-4 carburetor idle problems" and rather than finding nothing, this will show up to help them. Sunday night Ron, Brian and I met at the museum. We tracked down two little leaks and pulled the Jenny outside. It was a perfect evening for flying. We spent a bunch of time messing with the idle setting, and Brian almost reached his hand propping limit, but around 830PM, Ron took the Jenny for a 15 minute flight. Enjoy the video. Usually there is a crown at the museum and I get tons of video of the Jenny in the air. But for some reason, we were nearly alone. Tommy and Amanda Denton came to see the flight as did Christy Eberly. I apologize for the amateur cinematography. I was too busy watching the flight. On Thursday, John Gaertner from Blue Swallow Aircraft drove to Williamson, GA to deliver the rebuilt engine. We wasted no time putting it back in the Jenny. Then came time to hook up all the lines - water, fuel, oil, etc. After working from noon until dark, we decided to call it a day. Friday afternoon was more of the same - hooked up the throttle, mixture, temperature and pressure lines. By 6PM, it was time to take Jenny out into the sunlight. Success !! It started right away. Ran smoothly. 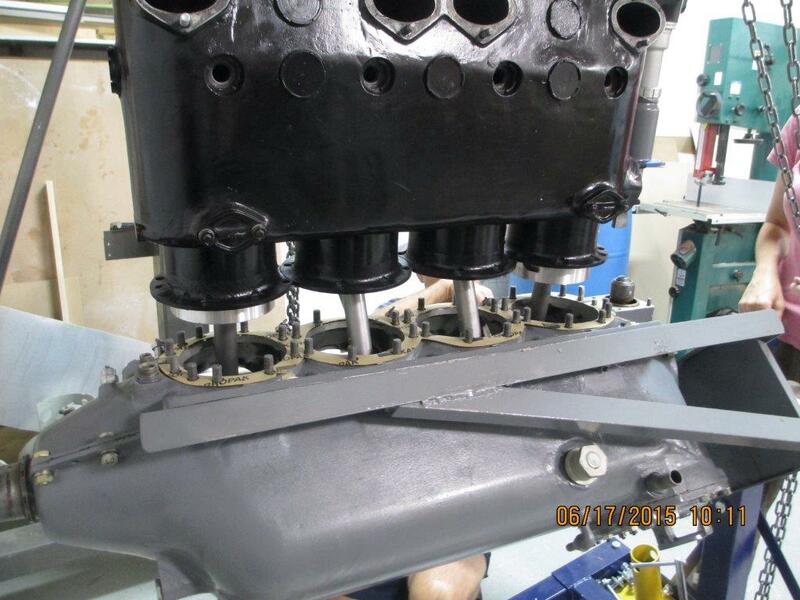 We have two little oil leaks to track down but once we do, the Jenny will back back in the air. Both upper camshafts were timed yesterday. 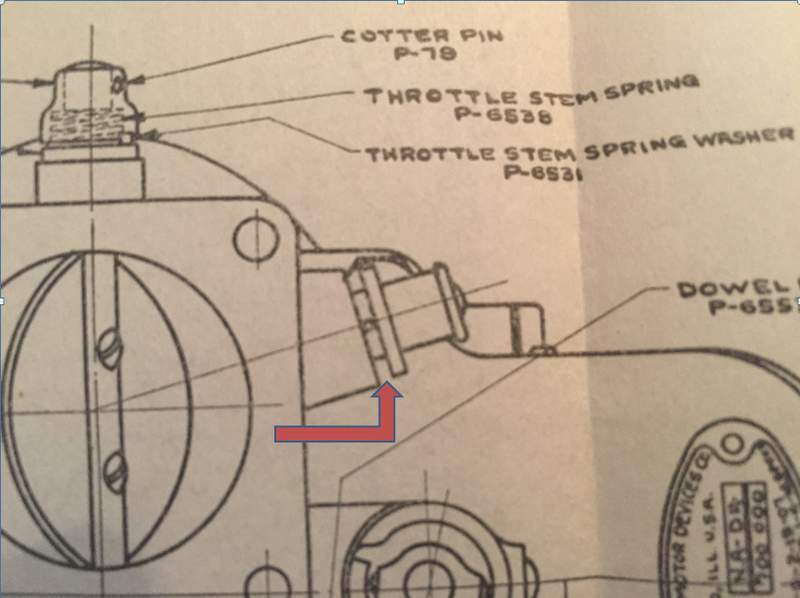 In the Hisso manual, there is a timing diagram that is used to time the cams. The diagram was enlarged and mounted on a piece of aluminum. More good news. 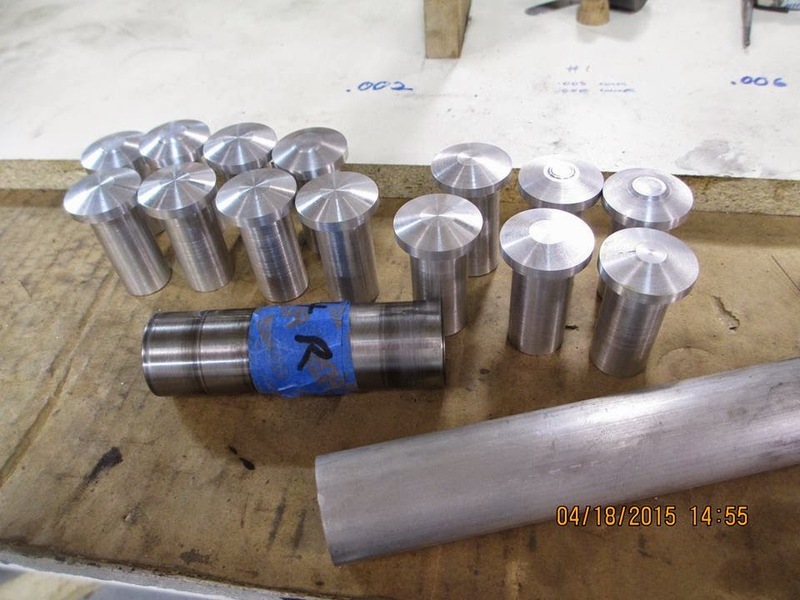 All the babbitt bearings have been poured and machined. 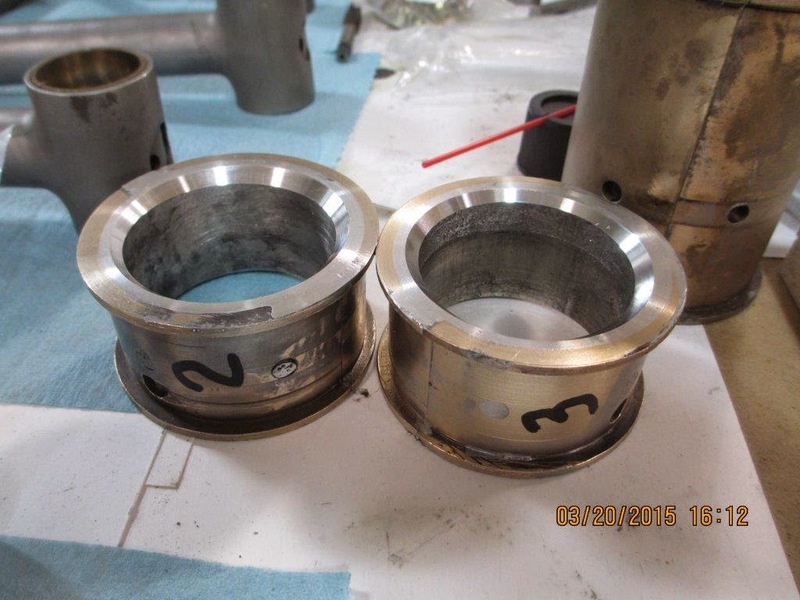 Here are the bearings inserted into their races. 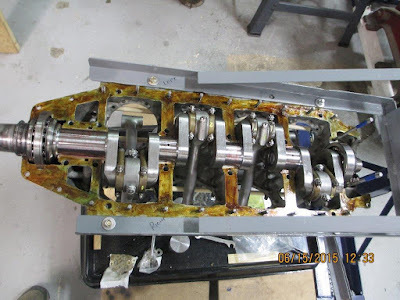 Meanwhile, the crankshaft gets the connecting rods installed. The two halves are given a sealant. 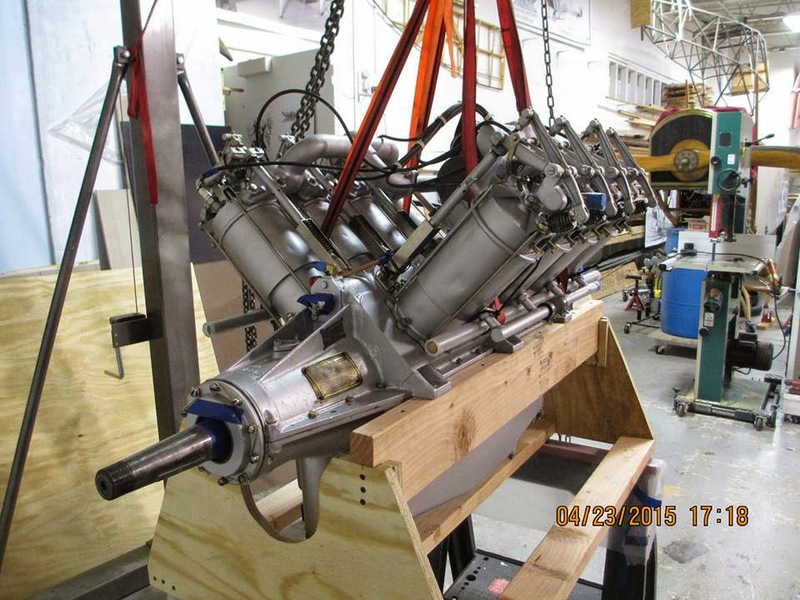 And the crankshaft is lowered into place. The bottom case half is installed and the perimeter bolts tightened. 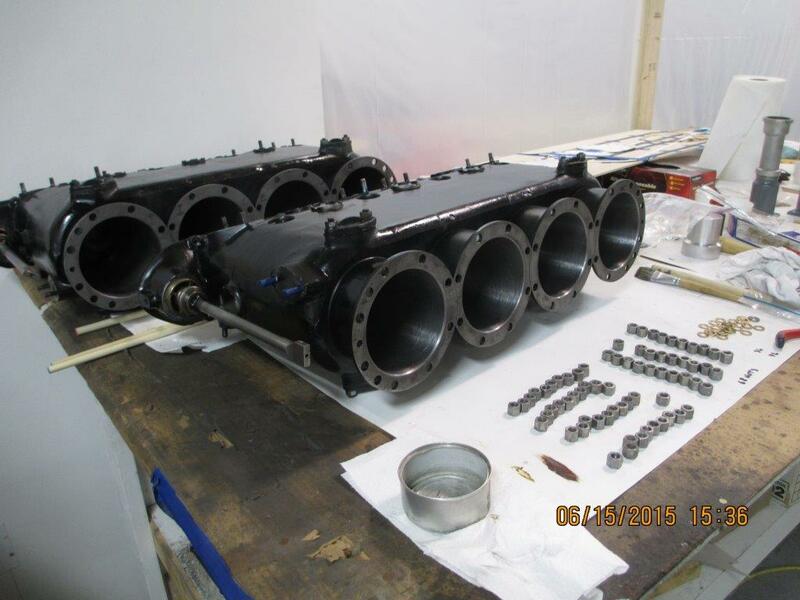 Tomorrow, the cylinder banks will be installed. We are getting closer to completion! Progress on the Hisso continues! Last week, I happened to have a work trip to Charlottesville, VA. We were only on the ground a few hours, but John Gaertner met me at the airport and I went to see the Hisso. Where do I start? OK, how about the valves. 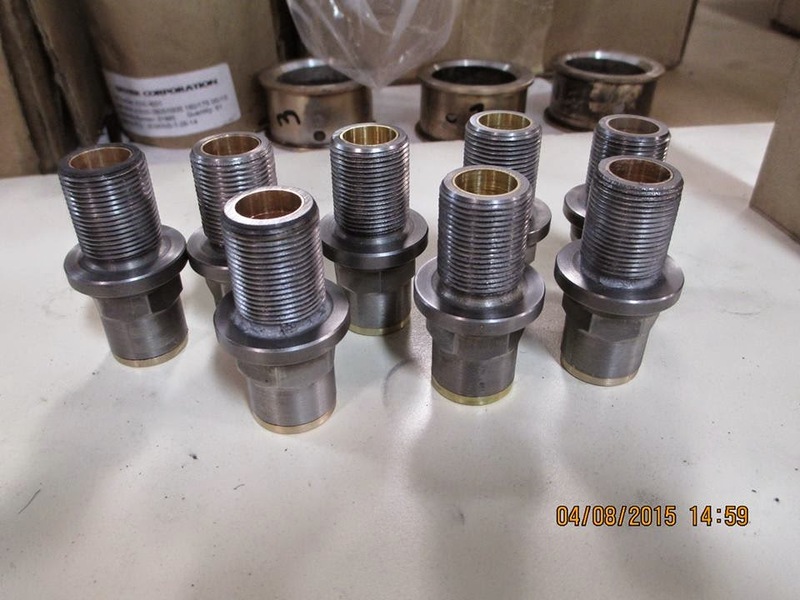 As mentioned before, all the valve guides were worn beyond tolerances. We decided the best course of action was to make threaded sleeves. Here you can see two sleeves and one sleeve already threaded into a guide. The bottom part of the sleeve was machines to match the guide. 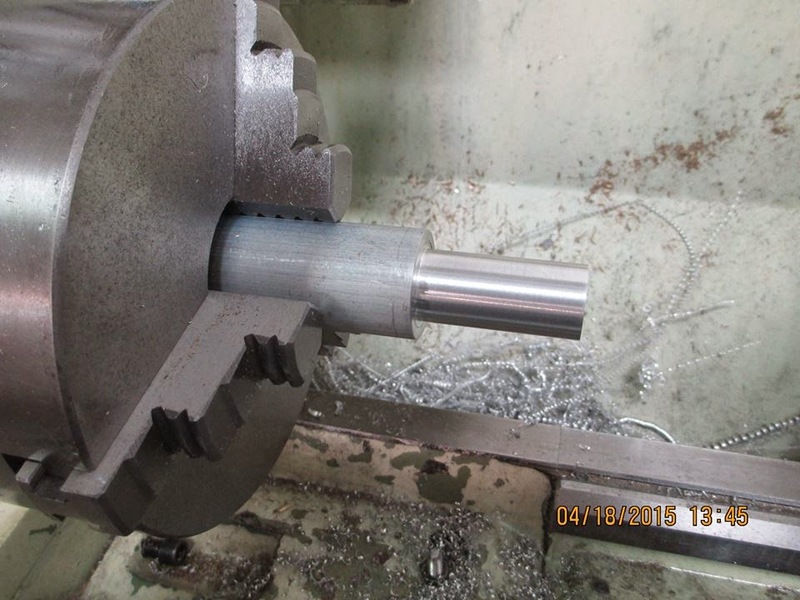 The sleeved guides were inserted into the cylinder banks. 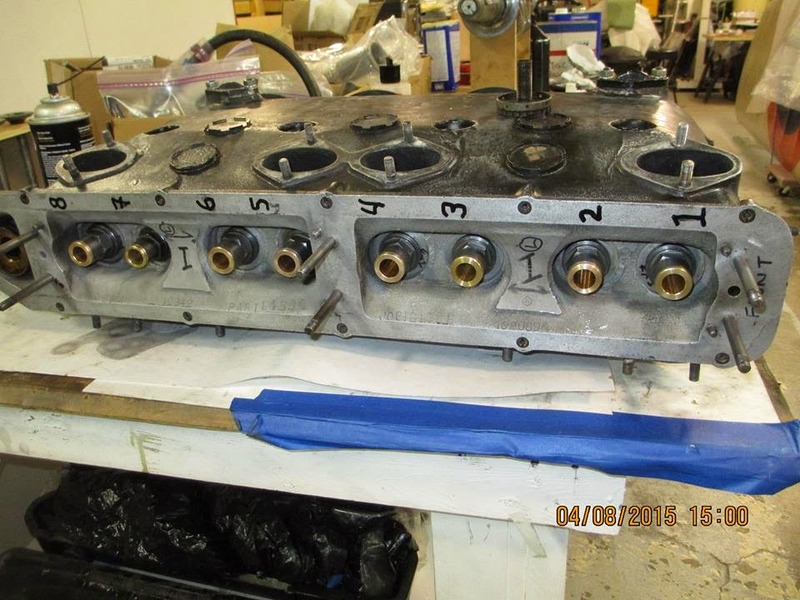 The valve seats were re-cut and the valves hand lapped into place. 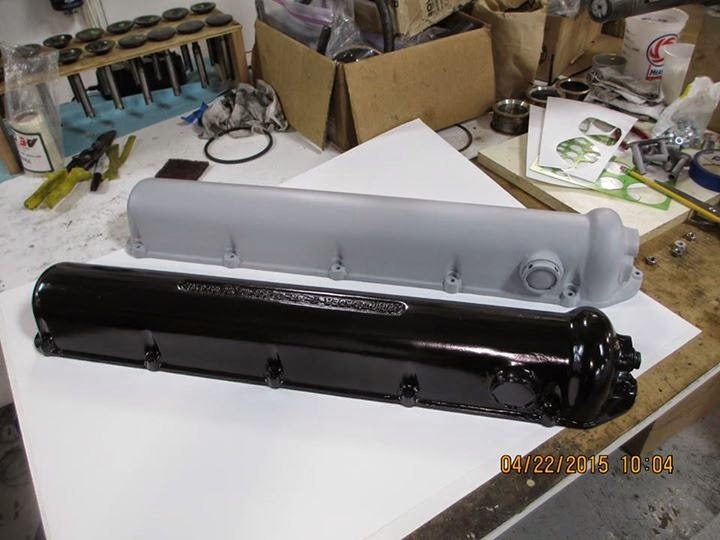 As were the valve covers. 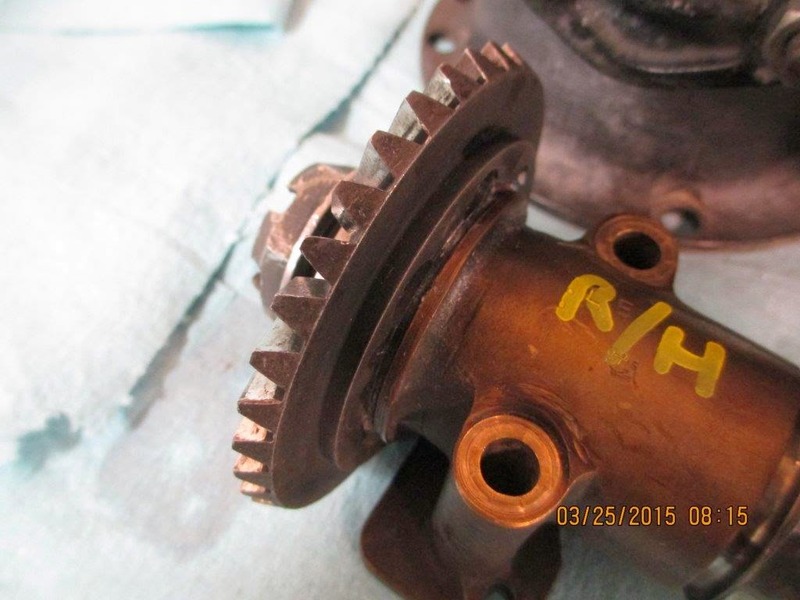 The left camshaft gear was missing a spacer. Not anymore. Also one of the end caps was missing. A new one was made. 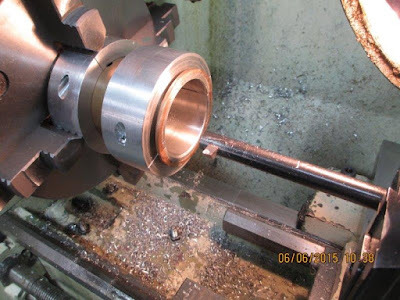 Pistons - since the rings in the engine were worn out, new rings were ordered. It was trashed. 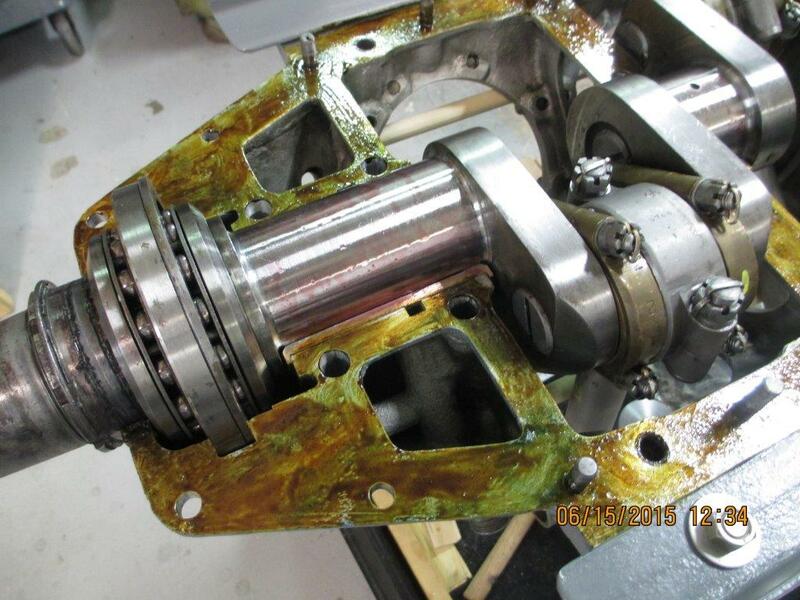 As you can see, part of the piston was eroded away. Blow by from the bad rings? I don't know. 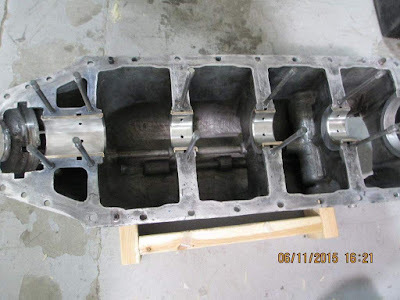 There was no way we could use this piston again. So, a call to Ross Pistons in California was placed and eight more pistons are being made. 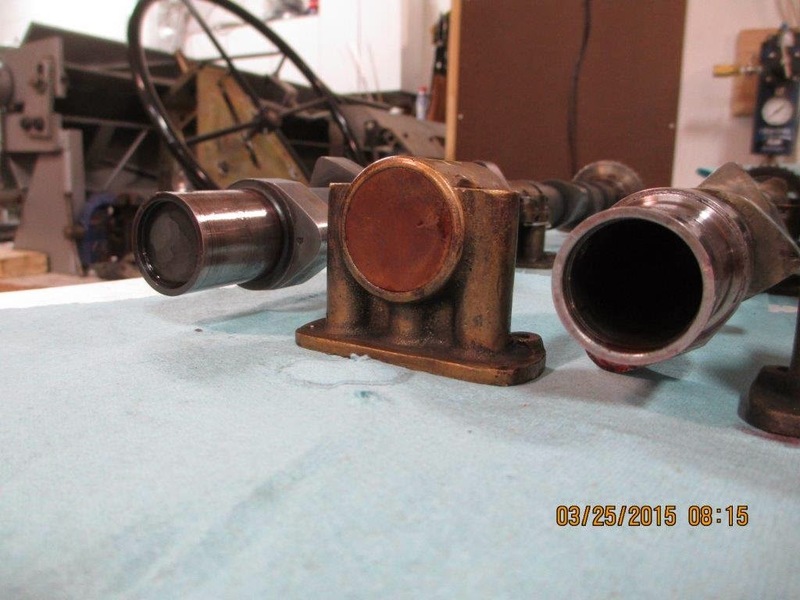 They no longer make the long, heavy original style pistons as you see on the left. The new ones are shorter and have one less ring. I worried about the difference until I talked to my friend John Saunders. John has two Hisso's of his own, knows a ton about them and assured me the pistons would work fine. Jack Kearbey has been running a set in his SE5A powered Hisso for a long time without any problems. 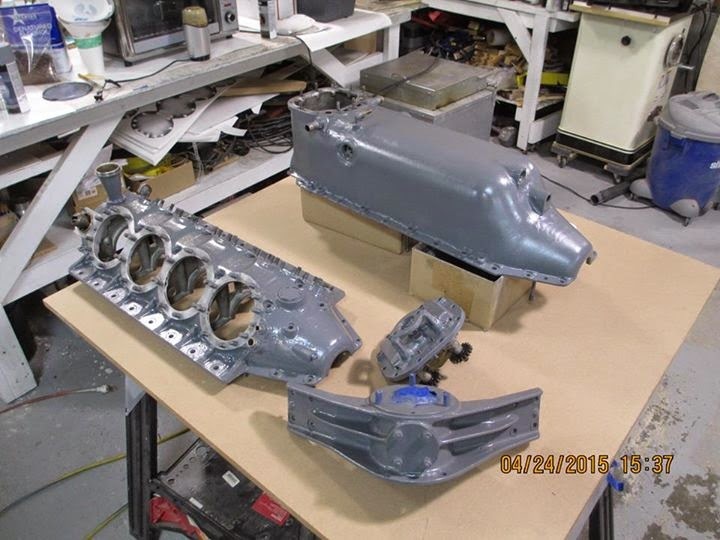 More bad piston news. 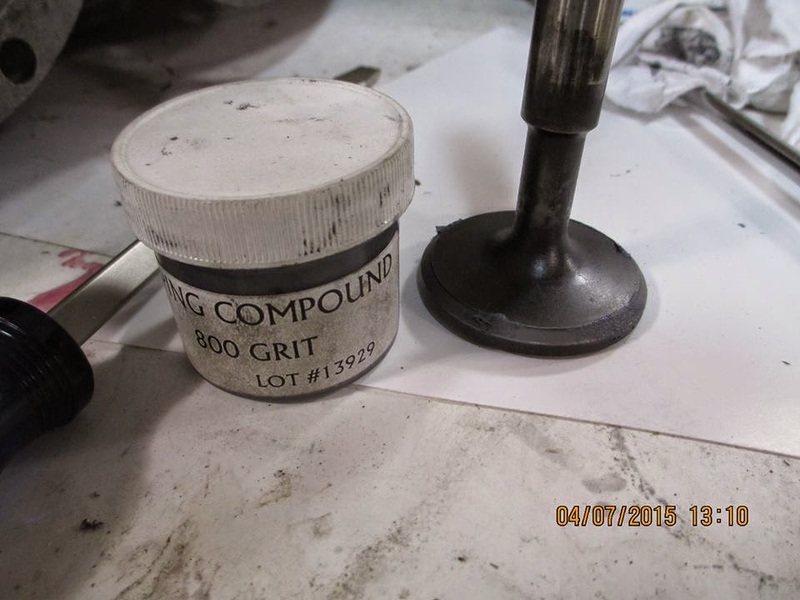 Several of the piston pin caps were deformed. New ones had to be made. 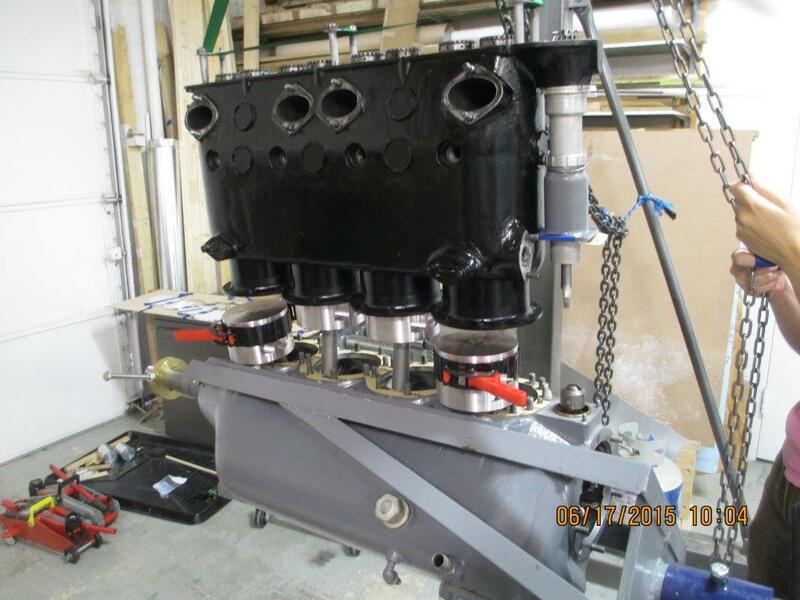 They were made oversize so when the new pistons arrive, then can be machined to match. 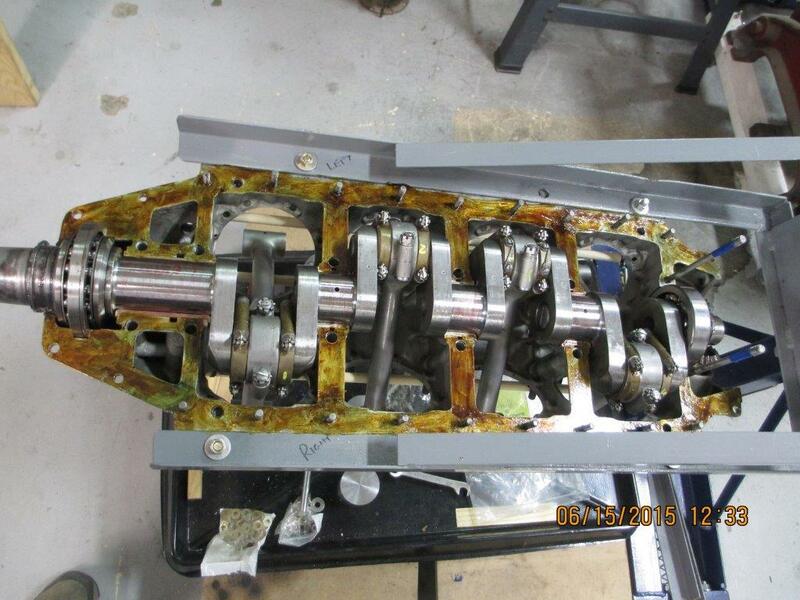 The case was split apart and the crankshaft was removed. More unpleasant news. The center three bearings were way out of tolerance! 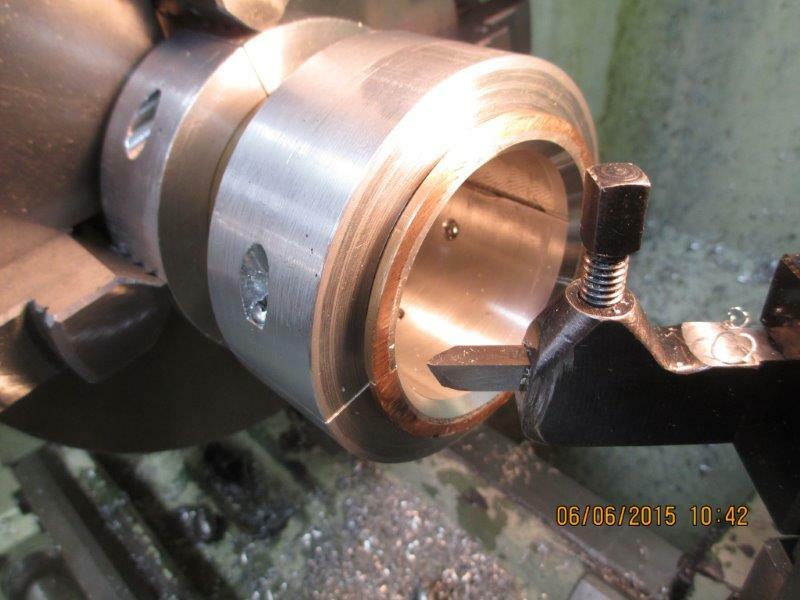 New babbitt bearings had to be made. 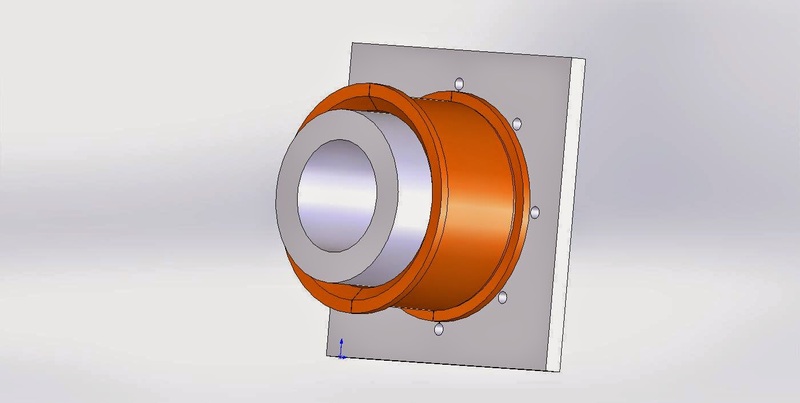 John designed this jig. 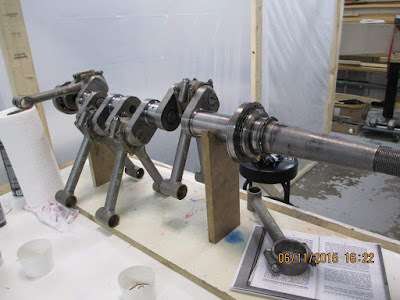 It is a fake crankshaft surrounded by the Hisso bearing shells. A gap is formed between them. In this gap, the molten babbett is poured. 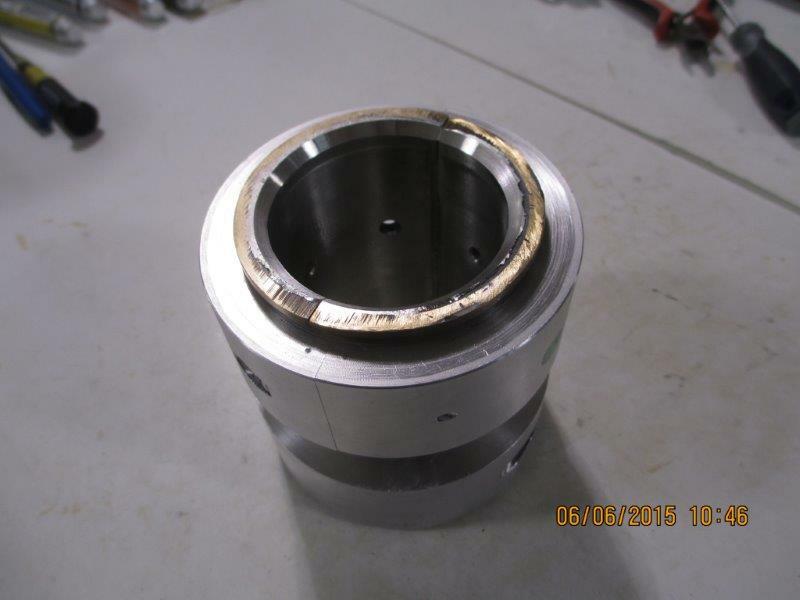 And the bearing is ready to be split and bored. 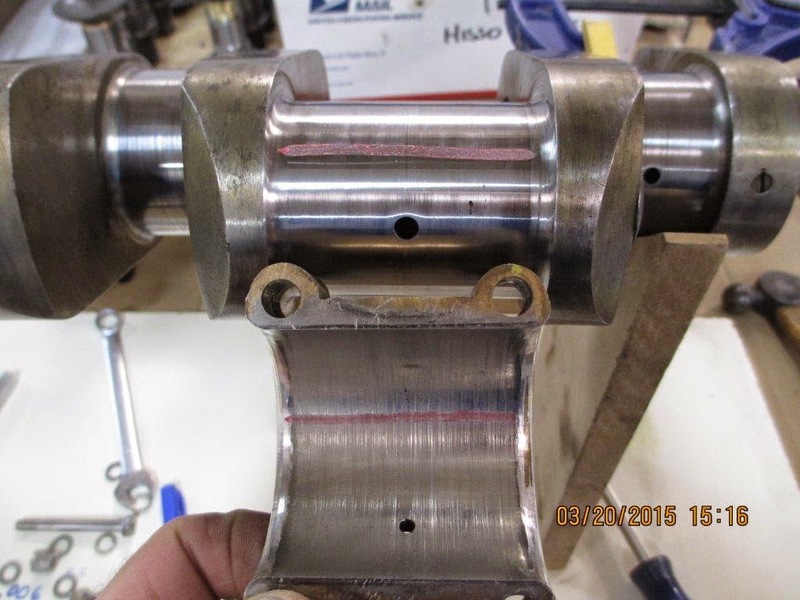 Good news - the connecting rod bearings checked out fine. The rest of the case has been painted. 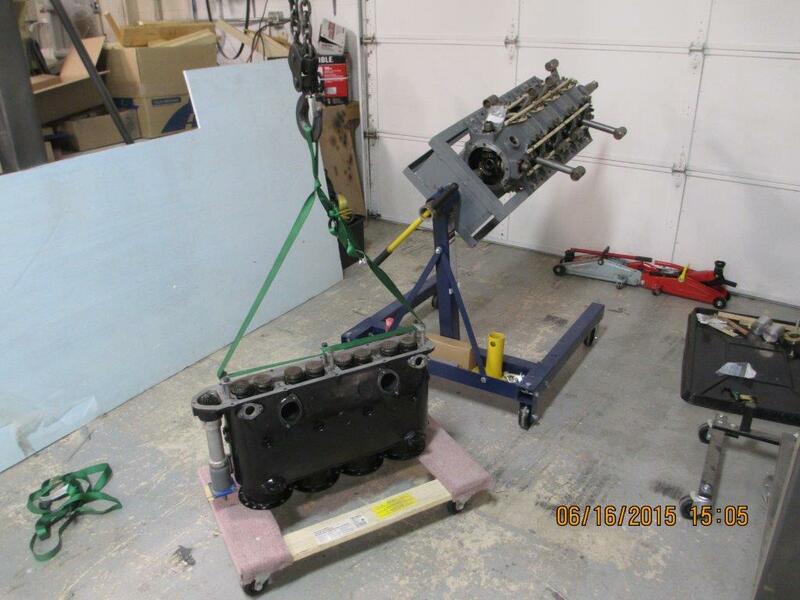 There are still a few more things to do but for the most part, the engine is waiting for reassembly. All we need are pistons! 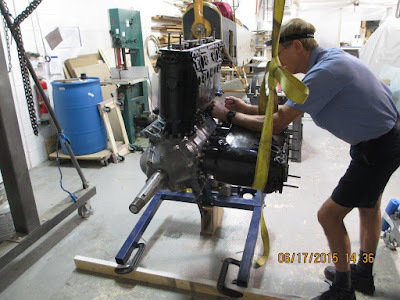 A few days before I arrived, the OX-5 that John overhauled for a customer left the shop. 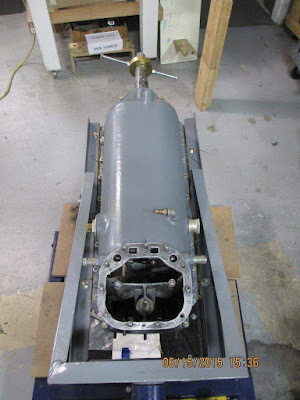 Congratulations on the completion of your Jenny!.....Thank you for documenting the process in your blog, an invaluable document for anyone wishing to build a Jenny, full scale or model. I though you might enjoy knowing how your project helped mine. I’m a modeler and primarily interested in precision aerobatics where I’ve competed for 40+ years. 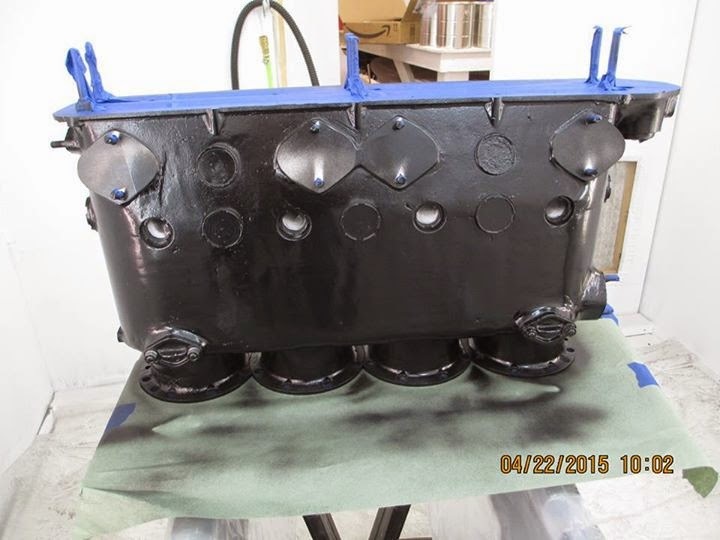 I occasionally take on something different, as you can see from the attachments, the current project is a Jenny. This all started half a dozen years ago with the purchase of a popular Jenny kit and the acquisition of documentation of a Barnstorming Jenny on display in an English museum. I quickly realized that the kit was lacking in the hardware and detail to really do the airplane justice. In further research I found your blog which offered the level of detail in parts and construction I wanted. I’ve spent hundreds of hours lurking and copying (in 1/6th scale) the parts and pieces from your project. April 10-12 I completed a bucket list item by entering the Jenny in the Weak Signals model show in Toledo, OH where it was awarded Best in Class. Please note that your blog is credited with a detail source in the display presentation. The history of the original airplane is quite interesting – well traveled to say the least. 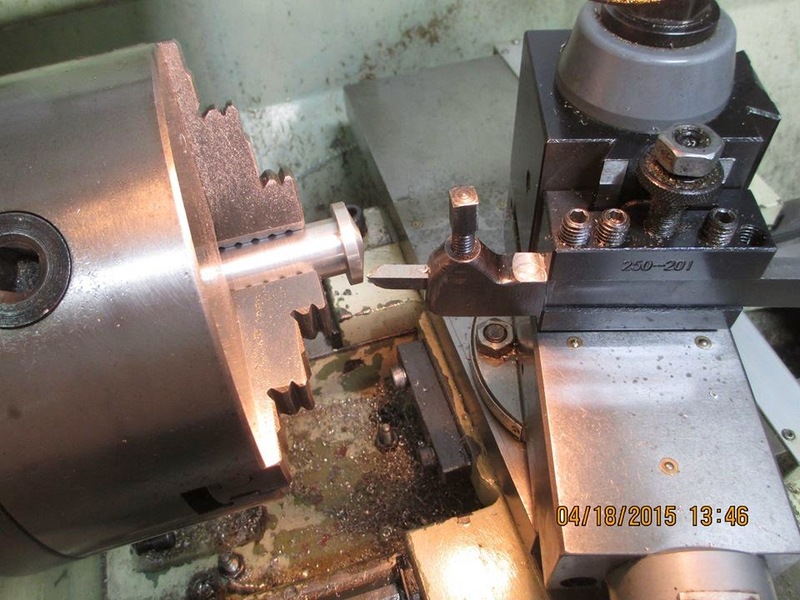 It would take too many words to describe all the tooling built to make parts, most the same as yours – just smaller. The bead roller for the fuselage cowlings, tooling to fabricate 100 shackles, hand forming the brass radiator, etc. The stick assemblies are ball bearing mounted, as are the rudder tiller bearings and elevator bellcranks – all operated by servos hidden beneath the rear seat. Even the aileron cable pulleys are fitted w ball bearings. One thing for sure, 1/6 scale provides many challenges as parts are small – lots of 00-90 capscrews. I haven’t flown it yet – wanted to get Toledo checked off first – and I’m way behind the curve on my precision aerobatic competition prep, but the Jenny is fully flyable (electric powered) and will fly this summer. You are welcome, Earl. Beautiful model.